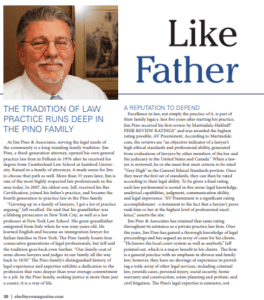 Divorce attorneys Jim Pino & Associates have built their reputation as litigators in contested divorces. In their 52+ years of combined experience, they have handled every aspect of divorce and family law. Criminal law attorneys Jim Pino & Associates have practiced in Alabama since 1976. They have represented clients against every type of criminal charge, from White Collar Crime to DWI/DUI to Drug Charges. Shelby County, Alabama injury attorneys Jim Pino & Associates will strive to get the maximum compensation for their clients when they have suffered a personal injury or developed a disability. Whether you’re safeguarding your family or accused of a crime, you need an experienced and effective attorney who will remain focused on the best possible outcome. At Jim Pino & Associates, P.C. in Shelby County, we’ve been dedicated to serving the needs of clients in Alabama for more than 41 years. We are known in Shelby County and the surrounding areas for providing proven and personalized approaches to protecting the rights of families, defending the accused and obtaining compensation for people who’ve suffered injuries. In any of these situations, you can count on us to provide the skilled advocacy and personal determination required to achieve the best possible results. 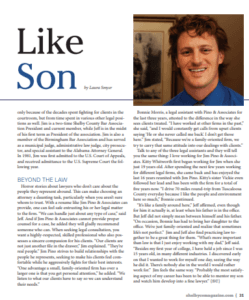 Highly responsive to personal needs — As a father-son legal team, we treat clients as family. We understand how stressful any legal matter can be, which is why we address your personal needs and unique situation at each stage of your case. You can count on us to answer your questions and concerns promptly so you are never left wondering about your case’s progress. Committed to results — In providing you with a strong criminal defense, we employ creative strategies targeted to your unique situation. We are equally committed to our clients’ welfare in injury and family law cases. You can rely on us to choose the most effective means available to resolve your legal matter. Highly rated and reputable — As a fixture in Shelby County since 1976, our firm is known in the community and among colleagues for providing exceptional advocacy for our clients. Attorney Jim Pino, a third-generation attorney, is AV® Preeminent™ Peer Review Rated by Martindale-Hubbell® in recognition of his high ethical standards and professionalism by lawyers familiar with his work. Attorney Jeffrey Pino follows in his family’s tradition of providing skilled legal support to Alabamans. No matter what your situation, choosing our effective and accomplished firm gives you the advocacy you need. Divorce and family law — Each family has its own unique circumstances, so divorce and ancillary family law issues such as child custody, child support and visitation should be handled by an attorney dedicated to your welfare and that of your children. We are committed to protecting your rights while helping you to move forward with confidence. Criminal defense — Effective criminal defense comes from a skilled, thorough and assertive attorney who can successfully uphold your rights under the law. Whether you’ve been charged with DUI, a drug crime or a white collar offense, you can rely on our extensive experience and full knowledge of local, state and federal laws. Personal injury — Accidents can happen even when you are a careful driver or just performing your job. When you’ve suffered a personal injury and need a strong and experienced litigator for an insurance, Social Security disability or workers’ compensation claim, you can count on us to fight for the maximum possible compensation. For trusted and established counsel in any of these areas, you can rely on us to protect your rights and fight to obtain a satisfactory result. At Jim Pino & Associates, P.C., we represent clients in family law, criminal defense and personal injury matters, and have done so for more than 41 years. Please call 205-490-8917 or contact us online to schedule an appointment at our Pelham office. Jim Pino & Associates, P.C. is located in Pelham, AL and serves clients in and around Pelham, Maylene, Siluria, Saginaw, Chelsea, Alabaster, Helena, Birmingham, Shannon and Shelby County.